The rapper comments on his ongoing legal struggles through the latest Wins And Losses clip. The "1942 Flows" music video starts with Meek Mill swarmed by reporters as he's released from prison. He describes feeling like a "freed slave," and comments on the reckless driving charge that landed him a two to four year prison sentence. 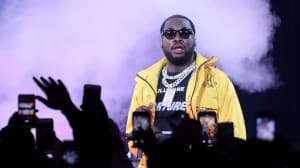 In reality, Meek is still locked up – the judge who has overseen his trial since 2007 has ignored calls for Meek's release from Pennsylvania governor Tom Wolf and Philadelphia District Attorney Larry Krasner, who has said it's likely Meek's original charge was tainted by a reportedly corrupt arresting officer. Presumably, Meek's role in this video were at least partially filmed after his most recent arrest but before his current prison stint. Shots of November's #FreeMeekMill protests help put Meek Mill's struggles in a systemic context, while footage of him living the good life and recreations of the mud he crawled out of all keep it personal, too. The context of the video is crucial: it comes as Meek's legal team appeals to the state Supreme Court for his release, a visual document in an ongoing saga that until now, has mostly relied on press statements. It has a rare poignance, like the clip is transmitting Meek's actual dream for a better tomorrow presented against the crushing reality of today. The new music video comes with a website: Justice4Meek.com. It contains to a Change.org petition asking for the bail release of all Pennsylvania prisoners who have filed Post Conviction Relief Act (PCRA) petitions.